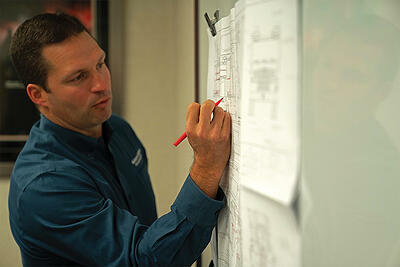 The process of purchasing fire apparatus can be both exciting and complex. There are numerous factors to consider when designing an apparatus that will have a critical impact on your community for many years to come, from intended use of the apparatus, level of run load, environmental and population factors, ideal service life, compliance, budget, and much more. This process can be especially overwhelming when departments face tight budgets and delivery time constraints. To design, order and produce an apparatus that meets all your departments needs while keeping the process simplified, it is important to keep these three considerations in mind. Another aspect of simplifying and accelerating the apparatus ordering process is to align your department with a trusted and knowledgeable dealer. When you have parameters in place concerning budget and delivery time, a dedicated sales representative will ensure that you do not have to compromise on customization, special feature requirements, and quality. Our apparatus dealers have extensive experience and a high level of understanding when it comes to the products and features available. They also have knowledge on what has successfully been put into service previously. In fact, there are times when customizations can be minimized, and the process streamlined within every element of the design, development, approval, and production. Additionally, working together to develop a timeline that fits the department’s needs and is mutually agreed upon by the manufacturer, will ensure the production of your apparatus is completed with a strong focus on the projected delivery date. In recent years, some fire apparatus manufacturers have developed web-based product configurations to assist with the planning and visualization of specifications for vehicles. In many cases, these configurations offer reduced feature customization options and have been used primarily to enable slight modifications and quick turnaround of stock trucks. The launch of Pierce Manufacturing’s Build My Pierce (BMP) rapid configurator has taken online apparatus design and specification planning tools to another level. BMP is not the perfect fit for every apparatus order as some departments require unlimited configuration options and features. BMP could be a valuable option if you are looking for an efficient ordering process and accelerated delivery for apparatus with a higher level of customization options than stock vehicles. When your mission is to keep your community safe, your options shouldn’t be limited! Take a look at recent deliveries that were produced utilizing Build My Pierce. Contact your local Pierce dealer to learn more about accelerating and simplifying the apparatus buying process and to give BMP a try yourself. Yes, I want to become a Pierce guru! Posted: Jan 17, 2019 11:42:44 AM by Pierce Mfg. Pierce Manufacturing Inc., an Oshkosh Corporation [NYSE: OSK] company, is the leading North American manufacturer of custom fire apparatus, including custom and commercial pumpers, aerials, rescue trucks, wildland trucks, minipumpers, elliptical tankers, and homeland security apparatus. In addition, Pierce designs its own foam systems and was the first company to introduce frontal airbags and the Side Roll Protection system to fire apparatus. Pierce markets its products through the industry’s largest and most comprehensive dealer and service network. The company enjoys a nationwide web of dealerships with over 600 certified and factory trained Service Brigade technicians and over 50 service centers. 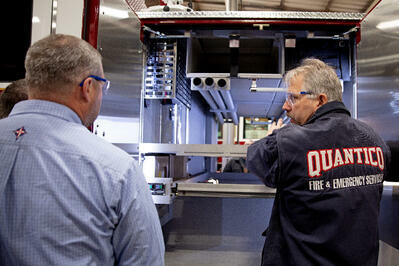 Visit piercemfg.com to learn more about Pierce. Founded in 1917, Oshkosh Corporation is 100 years strong and continues to make a difference in people’s lives. Oshkosh brings together a unique set of integrated capabilities and diverse end markets that, when combined with the Company’s MOVE strategy and positive long-term outlook, illustrate why Oshkosh is a different integrated global industrial. The Company is a leader in designing, manufacturing and servicing a broad range of access equipment, commercial, fire & emergency, military and specialty vehicles and vehicle bodies under the brands of Oshkosh®, JLG®, Pierce®, McNeilus®, Jerr-Dan®, Frontline™, CON-E-CO®, London® and IMT®. Today, Oshkosh Corporation is a Fortune 500 Company with manufacturing operations on four continents. Its products are recognized around the world for quality, durability and innovation, and can be found in more than 150 countries around the globe. As a different integrated global industrial, Oshkosh is committed to making a difference for team members, customers, shareholders, communities and the environment. For more information, please visit oshkoshcorporation.com.